With 2009 drawing to a close, we all look back upon what has transpired over the last 12 months. Hopefully you have had a productive and exciting year, full of more of the things you want to do than the opposite. Looking forward, I wish you a happy, healthy and productive 2010. My 2009 was fun, interesting, productive, and exciting. I officially launched this website, which has been great fun, and got serious about my photography. I am focused on learning as much as I can, and experimenting with different things so as to stretch my range and myself. The more I learn, the more I realize that I have much more to learn. I guess it is always that way. But then again, if you stop learning, you are basically dead anyways. So, here's to learning more in 2010! * Quality, not quantity - since I started on Flickr earlier this year, and then launched this website, one of my initial goals was to post a new image every day. I didn't exactly succeed, but that's ok since I am not getting graded (am I?). This year though I want to focus on posting what I consider a quality image. I felt like some of my posts in 2009 were not great shots, and I posted despite that fact because I was trying to get something posted. In 2010 I intend to focus on producing high quality images and posting them when they are ready. So, I envision about 4 posts a week, or something like that. * Focus on the composition - as I mention above, learning about photography is important to me since I want to continue to improve, and composition is a basic element. I feel like some of my comps are good, some are great, and some are just fair. I intend to experiment and try things so as to focus (no pun intended) on getting good comps and interesting ones too. * Slow down - sometimes I get in a hurry while setting up for a shot (doesn't everyone get a little excited now and then?) and either don't check all my camera settings, or miss an important element to the shot that I should have included. Unless the situation prevents it, I plan to slow down, breathe, and plan my shots this year with the goal of getting it right the first time. Well, that about covers it. I hope your 2009 was a wonderful year, and that you experience much health, happiness and prosperity in 2010. 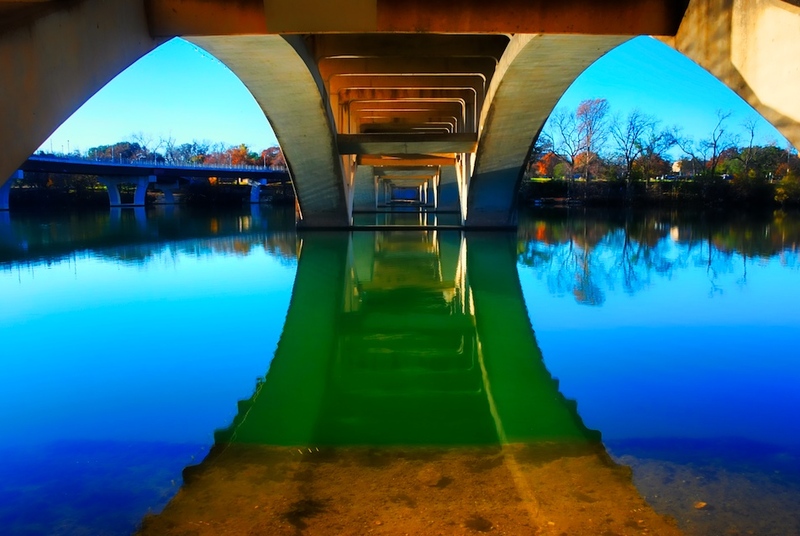 By the way, this was taken under the Lamar Street bridge in Austin (the same bridge from my last post), a few minutes before that last shot. It is a 5 shot HDR (-3, -2, -1, 0, +1, +2) taken at f/13. It was combined in Photomatix, then adjusted in PSE (Curves, Contrast) and Topaz Adjust. Thanks for visiting!